Woolen and worsted—these terms are thrown about a lot. To hand spinners they have very specific meanings.Worsted yarns are made from combed fiber preparation (think combing your hair) while woolen yarns are made from a carded preparation (think brushing your hair). As a spinner we have a lot of control over what kind of yarn we make. The secret is all in the preparation. Whether we buy prepared fiber or do the processing ourselves, knowing a bit about the subject will help become better spinners. We are frequently asked, "What is the difference between fiber top and roving?" Top is combed and roving is carded. Top has all the fibers aligned (worsted), while roving presents the fibers in a jumbled array (woolen). Top produces smooth, strudy yarns while roving produces fuzzy, lofty yarns. There are degrees of each preparation such as semi-worsted or semi-woolen. From left to right: English, Hackle (at rear) and Viking combs. Combing removes the short fibers, aids in dehairing, and leaves fibers of uniform length. At The Woolery, we stock three basic types of combs: English, Viking, and Hackles. 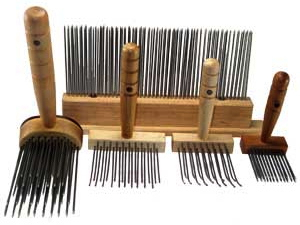 English combs are an excellent choice for processing large amounts of longish- stapled wool. Viking combs are good choice for processing small batches of fiber including short-stapled breeds. Hackles are beloved by many for color blending. Carding opens up the fibers, distributes them evenly, leaving them in a disordered arrangement. There are many styles of handcards. Their teeth vary in size. The closer the teeth are the better they are for fine fibers and inversely the wider apart the teeth the better they work for medium to corse fibers . 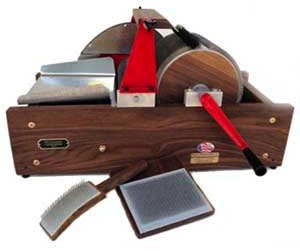 There is also the amazing drumcarder. It cards large amounts of fiber and is an excellent choice for making custom color blends to create unique handspun yarn. This barely scratches the surface on the subtleties of fiber preparation. Feel free to post your questions here or on on our Facebook and Ravelry pages.